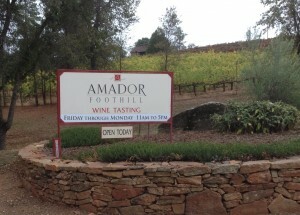 Come visit Amador Foothill Winery, and explore the historic gold country: Amador Foothill Winery is located on the western slopes of the Sierra Nevadas between Sacramento and South Lake Tahoe. It is a one hour drive from Sacramento, and about two and one half hours from San Francisco. We are also the closest wine country for the Reno and Carson Valley areas – a lovely two and a half hour drive on Hwy 88 over Carson Pass. The gateway to our wine region is through the bucolic town of Plymouth on Hwy 49. Amador Foothill is located about 5 miles northeast of Plymouth in the Shenandoah Valley. For directions to the winery, please click here. Limousines and bus groups must make reservations in advance. Groups of 8+ are charged $5 per person. Make a reservation today!